Water Lily Acoustics, Santa Barbara, CA, 1995, WLA-ES-50-CD. Produced and recorded by Kavichandran Alexander, co-produced by Dr. Dilip Raval. Performers: The Mevlevi Ensemble of Turkey, directed by Dogan Ergin. K�ni Karaca, solo vocalist. Liner material (36 pages) includes notes with photographs, drawings, the translation of the text and Quranic recitation, track numbers and credits. The recording of multimedia performances has been problematic since the beginning of the technology, with the performances of the Whirling Dervishes being no exception. During the 78 rpm era, one side of a record would be dedicated to each different section of the ayin (a complex suite form for the Mevlevi ritual), whether or not it fit. In addition, the tempo might have been adjusted according to the length of available time on records. Occasionally, on some of these records of the era, one can hear the performers speed up towards the very end of a piece in order to fit the music to the given time frame. For the same reason, traditional suites and other larger and smaller forms were sometimes rearranged. Besides that, we lost the use of silence during the performance, not to mention the choreography and other visual aspects of the performance. It has been 23 years since Atlantic Records recorded the "Music of the Whirling Dervishes," featuring such legendary names as K�ni Karaca and Aka G�nd�z Kutbay. Unfortunately, Kutbay, the celebrated ney (Turkish rim-blown reed flute) player, died in 1979. Dogan Ergin, also died too early in his career. Saadettin Heper, kud�m (kettle drums) player and keeper of a large portion of the classical and religious repertoire in a significantly oral tradition died before we retrieve untold treasures from his memory: a vast number of classical compositions, aspects of the traditional educational system mesk, and other historical data which are gone with him forever. Gone too is Dr. Celaleddin �elebi, the 21st direct line of descendant of Mevlana Jalaluddin Rumi (1207-1273) and Head of the Mevlevi Order, who (along with Kabir Helminski, a Sheikh of the Mevlevi Order) accompanied the Mevlevis during these tours and gave lectures at various institutions. 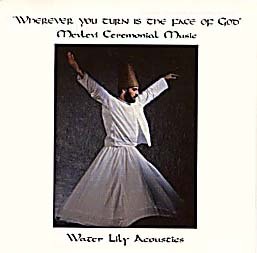 Most of the other surviving artists from this earlier recording do not want to take on the arduous US tours every December, but in the 1990s, Dogan Ergin directed the Mevlevi Ensemble of Turkey during their visits to the US, and produced two recordings in 1994 and 1995: "'Wherever You Turn is the Face of God': Mevlevi Ceremonial Music" and "Returning: The Music of the Whirling Dervishes." "Mevlevi Ceremonial Music" starts with the wonderful sound of �mer Satiroglu's ud in his legendary hamur, literally, "dough-like," hands [Audio 1]. Reha Sagbas then takes over on the kanun (72-string-zither) [Audio 2] in their opening taksim (solo improvisation) that sets the mood for a spiritual journey. The Labbayk medley, a collection of ilahi-s (Sufi hymns), zikr (a Sufi chant using the names of God) and vocal and instrumental improvisations follow the opening taksims. The medley gets its name from the first ilahi, "Labbayk," composed by renowned master vocalist K�ni Karaca. Coming from a lineage of great masters, Karaca is well respected by most other classical musicians for his knowledge of a very large repertoire in rare classical makam-s and large forms, his improvisational technique and style of vocal genres, and his theoretical knowledge makam-s and usul-s. The performance of the Labbayk incorporates a call and response technique [Audio 3a] between Karaca and other members of a male choir, themselves master musicians of the Istanbul State Radio. Later, Karaca inserts vocal improvisations in free rhythm on top of the ostinato rhythms of the zikr [Audio 3b]. As are the four vocal sections (selam-s) of the suite, the pesrev, instrumental overture with four sections (hane) and a ritornello (teslim), is also composed by the famous Hammamizade Ismail Dede Efendi (1778-1846), known simply as "Dede." The third selam displays the usual sequence of three usuls: 28-beat Devri Kebir (single, not double) [Audio 9a], 10-beat Aksak Semai (3+2+2+3) [Audio 9b], and 6-beat Y�r�k Semai (2+1+1+2), respectively [Audio 9c]. Like the second selam, the fourth is in Evfer. In addition to the rhythmic ones, there are also a number of masterful melodic modulations in the suite. In this recording, the Fourth Selam is followed by a short improvisation (taksim) on kemen�e (three stringed fiddle), the ensemble (mutrib) performs a Segah Ilahi, both usual. As is customary, a Quranic recitation concludes the performance. Although Karaca is occasionally criticized for stretching the rules of tajwid, a set of rules regarding the pronunciation and recitation of Quran, no one can criticize him on musical grounds. In this extraordinary performance, Karaca modulates masterfully from one makam to another. He starts his recitation with a meyan- like section in the high register and he modulates to other makams with ease. Karaca finally returns to the original makam without the slightest variation from the original pitch level.